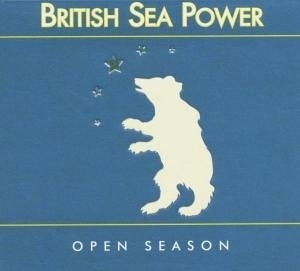 Open Season is the second album from the Brighton-based English band, British Sea Power. It was released on 4 April 2005 to positive reviews. It showcased a more accessible, mainstream sound and reached #13 in the UK album charts. Almost all of the songs featured on the album were recorded with Mads Bjerke, who had previously worked with the band on their 2002 album, The Decline of British Sea Power and also with Primal Scream, Girls Aloud and Spiritualized, and mixed by Bill Price, with the exceptions of "Please Stand Up" and "North Hanging Rock", which were produced and mixed by Graham Sutton and engineered by Phill Brown. "Oh Larsen B" was recorded by George Apsion and Tariq Zaid Al-Nasrawi. Two singles were picked from it: "It Ended on an Oily Stage" (UK #18) and "Please Stand Up" (UK #34). If the CD is rewound 2:31 before the first track, an organ version of the song "How Will I Ever Find My Way Home?" is found. The lyrics and title of "Oh Larsen B" refer to the Antarctic Peninsula ice shelf Larsen B, which collapsed in 2002, a few years before the release of the album.